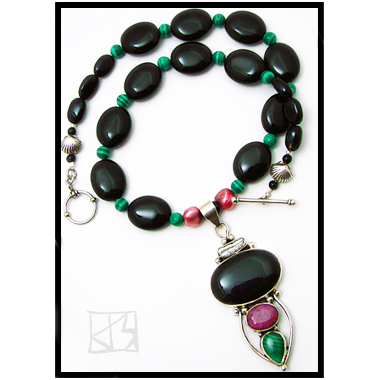 The beauty and power of four different stones in one phenomenal piece! Balancing the dark mysteries of opaque onyx is the deep magenta power of ruby, the variant greens of malachite and the iridescent brilliance of pearl, nestled in a frame of minimal silver geometry. 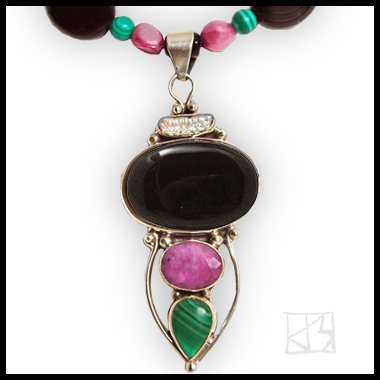 This center of energy hangs from a strand of matching onyx ovals, malachite rounds and magenta pearls. Elegant Thai silver scallop shells anchor the beads towards its secure silver toggle. 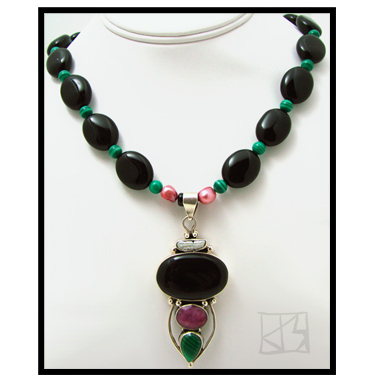 Both elegant and bold, this piece will reflect your story to everyone you meet!